With its slight sheen and textured eggshell pattern, the Superb Dew Federal valance adds a soft touch to any space. It features three scoops with sewn-in folds for easy hanging and is made from soft, 100 percent cotton. Measuring 80 inches wide by 15 inches long, it fits a standard single window. 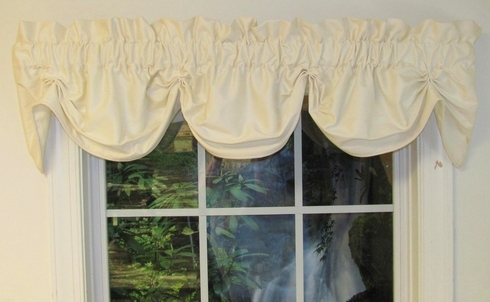 This eggshell valance has a three-inch rod pocket and 2 ½-inch header and is fully lined with off-white fabric. Dry clean recommended. Fully lined in a high quality off white lining fabric. 100% Cotton, dry clean recommended.